DarXide is functional. There’s a hearty slice of unenthused praise if ever I saw it, but it’s the kindest description I have. It’s not broken in any way; it controls fine, it’s not buggy or glitchy. It tends to suffer from slowdown when the screen starts to fill, but that’s quite understandable, because its one big selling point is that it’s kind of gorgeous. The kind of gorgeous that’s a strain for 90’s system to load. While hardly amazing by today’s photo-realistic standards, for the early 3D pioneering days, DarXide was a trendsetter. Check it out, resplendent in all its texture-mapped polygons long before that became the norm. Sure, pretty dated now, but back in the hazy pasts of 1995 that was some cutting edge tech. Originally set to be a launch title for the doomed SEGA Neptune, the console that was designed to combine the Mega Drive and the 32X into one big lump, it was supposed to show off that system’s power. 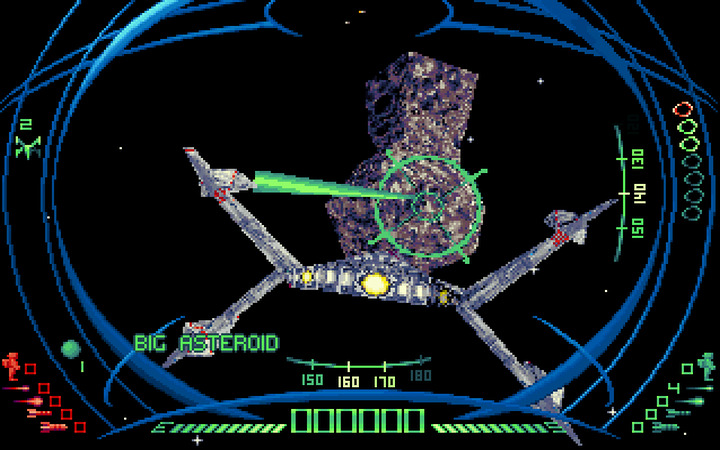 It does; DarXide’s a true showcase and has aged a lot more gracefully than a lot of the 32X’s backlog. It was important for SEGA to demonstrate that their new weird hybrid system could kind of hang with the upcoming 32bit machines and, at first glance, DarXide was their big statement to show that it kind of sort of could. This falls apart, though, if you actually play it. Which isn’t a likely problem; copies of the game only exist in legend, making rare EBay sightings price in the thousands of pounds range. After the SEGA Neptune was binned, DarXide was only released on the 32X in the EU region, giving it a very limited run, which makes it very collectable. I guess because it’s a nice thing to own? It’s certainly not that great to play. The unenviable reality is that DarXide is a bloated tech demo. There’s nothing definably wrong with the game, aside from the fact that it’s completely vapid and irredeemably shallow. It’s unashamedly a 3D version of Asteroids, which means you fly around a small pocket of space, shooting at space boulders. But DarXide expands the field of play tremendously, and, by doing so, manages to completely miss the point of the original. Both games have you flying around shooting at large rocks which then explode into smaller rocks, but in Asteroids, that invited chaos. Your slow, cumbersome triangle fighter craft then had to deal with numerous splintered comets -- smaller, faster, harder to hit. Just grazing one meant death. In DarXide, you find a hunk of rock and shoot at it until it splinters and dies. There’s no chaos in DarXide; there’s very little of anything. By abandoning the claustrophobic, penned in arena of Asteroids and inserting three dimensions of free roam, they render the entire point of that classic game moot. So, in an attempt to reign in some kind of relevance, the premises stops being about survival and becomes a time attack, asking you to break all the space rocks while a timer ticks down. So you squint at a tiny, worthless map compressed in the top right corner, searching out dots that are sometimes asteroids to shoot. It even gives you a scrap of a storyline; turns out you’ve been dispatched to save some deep space miners. You save them by exploding the asteroids they’re based on. Sometimes you come across abandoned spacecraft, which you can blow up to get crystals which refill your shield, because DarXide can’t even be bothered to emulate Asteroid’s insta-death from collision right. Sometimes alien saucers show up to shoot at you ineffectively, drawing in all your attention with their ridiculously loud, flashing colour scheme. Nothing says fear the skies like an invading alien force covering their crafts in surplus disco lights. You can blow them up for points, I guess, but they’re more or less meaningless. You search a large pocket of space for small gatherings of rocks, guided by insignificant radar and threatened by nothing of substance. DarXide feels like it was built to be admired, to be something placed on a pedestal for people to reverently gather around and nod approvingly at. On some small scale, it worked, showing that the 32X and, in theory, the Neptune, could do some things with polygons and textures that the 16bit machines had no chance of emulating. Only, so what? The PlayStation and the Saturn were already showing they had the same processing power and then some, making DarXide’s one big attraction obsolete almost upon arrival. Stripped of its spectacle, all it had left to fall back on was its worth as a game. I’ll let you know should ever I find any. If you enjoyed this Darxide review, you're encouraged to discuss it with the author and with other members of the site's community. If you don't already have an HonestGamers account, you can sign up for one in a snap. Thank you for reading! Where the hell did my original feedback topic go? Looks like Marc's mastered time travel and was able to go back in time to 20-some years before DarXide was released in order to start a thread on a brand new review of it. Or something's glitched with the site's time-stamp. But I like my interpretation better. I actually made a topic for this review a few days ago, complete with typo catches, and it just disappeared into the ether. Then I made it again, and it didn't show up on the main page -- only under the review. Only on the third try did it stick, but all of my super valuable advice has been lost forever. I did catch that topic before it vanished into the void, so carried out a lot of the fixes you suggested, because there were good and made sense. I appreciate the effort, even if the site decided to eat it. More 32X goodness to come. Sorry for the disappearing topics, which I didn't know about until I read this thread just now. There probably are a few irregularities in the site code, hanging around after the timestamp changes that I didn't want to have to make. As I catch them and can consistently reproduce them, I'll be better able to hopefully resolve them. In the meantime, please continue to make noise about them so I have enough information to implement a fix... and sorry for any posts the forums may happen to eat. None of the material contained within this site may be reproduced in any conceivable fashion without permission from the author(s) of said material. This site is not sponsored or endorsed by Nintendo, Sega, Sony, Microsoft, or any other such party. 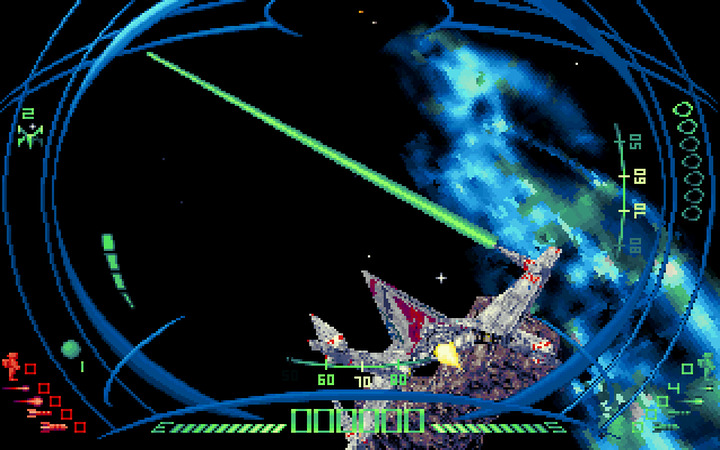 Darxide is a registered trademark of its copyright holder. This site makes no claim to Darxide, its characters, screenshots, artwork, music, or any intellectual property contained within. Opinions expressed on this site do not necessarily represent the opinion of site staff or sponsors. Staff and freelance reviews are typically written based on time spent with a retail review copy or review key for the game that is provided by its publisher.